The main body of our farm sits on a bend in the South Toe River. We are definitely not the first ones to coax a living from the sandy loam. We are always reminded of those who came before as we pick points and pottery from our soils, some thousands of years old. 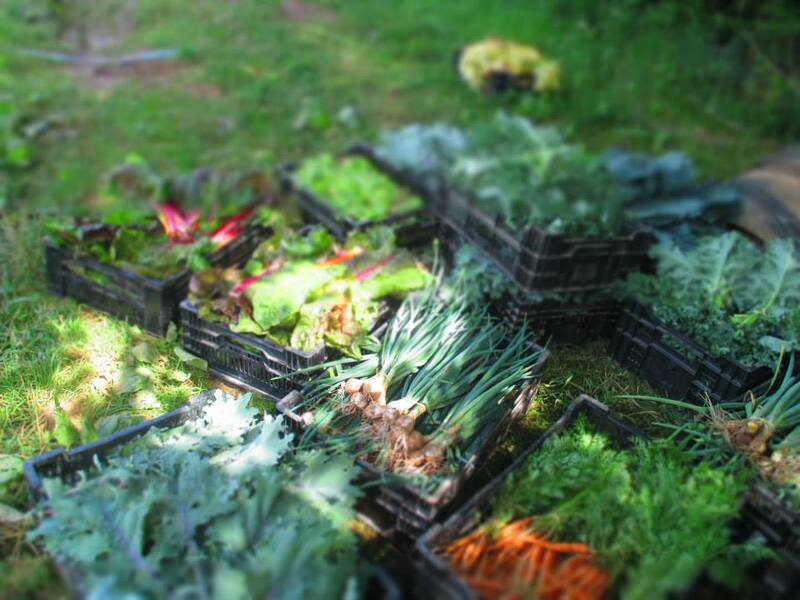 We grow six acres of Biodynamic vegetables in a scattering of soil types and fields, from sandy loam to clay loam. As a wife and husband team of Nicole DelCogliano and Gaelan Corozine we have been here since 2001, along with our two daughters. Our farming philosophy: We started practicing biodynamic farming on the land in 2004. We feel it speaks to our philosophy and perspective of approaching our farm as a whole organism. Husbanding animals is also very important for us as we make our own Biodynamic compost from their manures .Farming is more than economics to us; it is a lifestyle and a culture that we strive for. Our two daughters have grown up from birth on our backs in the fields and we are immensely proud of that. What we grow and how: We grow vegetables of all kinds, a mix of heirlooms and hybrids, outdoors and in 3 high tunnels. We have worked hard to find which varieties work well for our land, but are always exploring new products. We use a 45 hp Kioti Tractor for bed preparation, primarily using a Imants spader. As inquisitive people we nurture an understanding and study of the land we farm on. All of our cultivation is done by hand with scuffle hoes or hand weeding. Over time we have seen our weed load lessen along with disease pressure and now we have cut back severely on supplemental watering. Believing that good veggies taste better when they have to work a little to get what they need. We market 9- 11 months a year, selling at the oldest market in Asheville, North Asheville Tailgate Market and Asheville City Market. We also sell to regional restaurants, such as Farm Burger (Asheville, NC), Early Girl Eatery (Asheville, NC), Smoky Park Supper Club (Asheville, NC), Cucina 24 (Asheville, NC), Nightbell (Asheville, NC), Rhubarb (Asheville, NC), and Curate. We also have dried flower wreaths for sale. "We have been working with Green Toe for almost 15 years and have been pleased 100% of the time - both with product and service." "I have been a member of Green Toe Ground's CSA for over 12 years. Having the CSA with them is a way of life for me and my family. Gaelan and Nicole have become close friends of mine. They have a wonderful way of connecting with customers through the food they sell. I believe they embody what it means to be an organic farmer in their relationship with the land, their lifestyle and beliefs, and the people they serve." We have been farming for twenty years and we still love it. During that time we have worked side by side with over twenty young folks most of whom have gone on to form a relationship with farming in some manner. As certified farm nerds we love to share our experiences and anecdotes but love to hear yours as well. We want folks who are engaged and interested in pursuing agriculture in some manner. Being farmers does not define who we are as we have travelled extensively and are active in social justice work. You will take part in ALL aspects of farm work, from harvest management to animal husbandry, to greenhouse work and long hours weeding and harvesting. You will also have the opportunity to learn marketing, sales and some aspects of agritourism. Above all we would hope that you make our farm YOUR farm for however long you stay. We offer apprenticeships mid March thru October, with the possibility to extend. We work Monday through Friday 7AM to 5 or 6PM as needed, with a 2 hours lunch break. As the weather gets warmer, we often start earlier in the morning. Tuesdays and Fridays are harvest days, and Wednesdays are delivery days to restaurants in Asheville. The Asheville City Market and North Asheville tailgate markets require us to leave the farm by 5:15AM on Saturdays. Apprentices come to market on a rotational basis, and when not at market, cover other chores such as feeding and watering of animals, watering starts in the greenhouse, etc. We offer a weekly cash stipend and monthly food stipend to use at our local food cooperative or the farmers market. Apprentices live in an off the grid cabin with water catchment system for washing dishes. There is an oven and stove, outdoor toilet, and a solar shower bag at the cabin. Apprentices do have access to a refrigerator. We offer vegetables from the farm, eggs, and milk as available. Apprentices get a full paid week off each season, organized in advance. We also make room for days off as needed for friend and family visits. We also pay for apprentices to attend the Southeast Regional Biodynamic Gathering each October in TN as well as membership in CRAFT, an apprentice and farmer network. We do not offer Wifi but locally the Celo Community Center (right down the road) also has wifi access and it is open to the public to use. We request limited to no cell phone use during farm working hours. Interning with us will give you a breadth of knowledge about how to grow and market veggies. Farming is hard and takes commitment, but the rewards are great if you put in the time. We recognize that we are asking a lot as farmers but feel that we have a lot to offer, not just basic farm work, but a deeper connection to land and environment. Our farm is an active member in the CRAFT network. We live in a beautiful place in the South Toe River Valley at the base of the Black Mountains, in the township of Celo, NC. Once summer starts, there are lots of music festivals and events in Burnsville and the surrounding regions. We have a large party for the 4th of July, with music and a DJ, Farm Olympics, and fireworks. Celo has a pickup soccer game every Sunday. 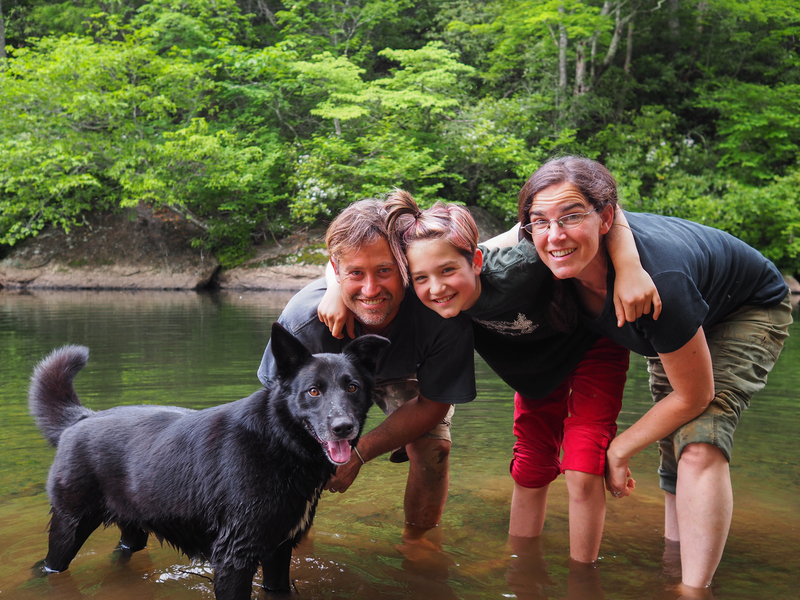 Biking and walking and hiking trails are abundant in Celo and in Pisgah National Forest, and we have the best swimming holes in the area right on our property! We request applicants come with an open and curious mind and a willingness to adapt and learn. These are critical skills to success at our farm. We may not do everything perfectly or the way you expect, but we do have our reasons. A car or truck is handy to have at our farm so you can leave when you'd like. To inquire about employment opportunities, please contact us by email or phone in December or January or visit our website for further information. "Working with Gaelen and Nicole was a really special experience. They are simultaneously filled with knowledge and also understand the value of self experimentation as a powerful way of learning. They have their ways and practices, but I was able to try things out in my way, and encouraged to use my own skills and understanding to perform a task. There is structure, and also freedom. The farm itself is idyllic, dropped in the heart of the Blue Ridge mountains, nestled up against the stunning South Toe river. You work hard and play hard. There is time for exploration of the area and dips into the cool water when a days a hard work is said and done. The farm is a run using biodynamic principals which is powerful way to orient oneself around growing systems and food production." "Nicole and Gaelan are great farmers to work for and learn from! Lifestyle is rustic, a bit remote, and absolutely lovely. Workload is fair, and varies depending on the time of the season. Overall highly recommend Green Toe Ground if you are looking for experience with a small scale, minimally-mechanized operation... especially if you're interested in learning about biodynamics, animals, living off grid, and getting to know some truly great people!" "Wonderful farm in gorgeous setting. Salt of the earth folks. The most realistic farming experience." We host 1-2 farm dinners per season. Our farm is available for event space (limited). Please visit our website for more information.